Decorative wreaths date back to ancient Greek and Roman times when they were seen as signs of victory and achievement. During those times, however, the wreaths were smaller as they were commonly worn on a person’s head instead of hung over a door. The Greeks awarded them as victory crowns for competition in the Pythian Games, a precursor to the Olympic Games. Roman women wore the wreaths as a symbol of pride. The wreaths, handmade from flowers, twigs, branches, thread and laurels came out mostly on special occasions such as solstice festivals and weddings. It was the Germanic people in pre-Christian times who began entwining evergreen branches into wreaths similar to what we would recognize in modern holiday decorations. The Germanic tribes gathered the evergreen wreaths and lit fires to fight off the cold and dark of Eastern European winters. The wreaths and fires become symbols of hope for the return of light and the spring of renewal. As Christmas began to be celebrated near the time of the winter solstice, Christians embraced the popular traditions. By the 16th century, German Catholics and Protestants used the symbols of wreaths and fires to celebrate the Advent of hope in the coming Christ. The symbolism of the Advent wreath spread rapidly from Germany to other areas of the Christian world. Evergreen tree twigs, interspersed with pine cones and decorated with a bow of red ribbon make up the Christmas wreath we know in current days. While the Christmas wreath is hung vertically on the front door or over the mantle, the Advent wreath is laid horizontally with four candles placed in the evergreen circle, while a fifth candle is placed in the middle. The candles are lit before the evening meal, one the first week, and additional candles in the succeeding weeks until the fifth candle is lit on Christmas Day. 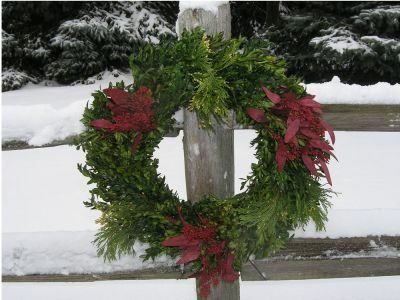 Whether you use a wreath for its religious symbolism during Advent or as colorful decoration to welcome the holidays, you can complete your holiday décor online with a fresh Christmas wreath from ChristmasFarms.com. Beautiful, fragrant wreaths also make great gifts for friends, co-workers and business associates. And we make it simple by delivering the wreaths right to their doors, and to yours, within a guaranteed delivery timeframe that you specify.